Condition is Used. ELASTICATED CUFFS MACHINE WASHABLE. Length: 112cm. In very good used condition. The buttons on the sleeve are a little worn. Grey / lilac in colour with a floral print, lace detailing on the body, lined in the skirt half but not on the top half making it slightly see through. This item is a ladies dress from Next. It is in good used condition and is washed and ready to wear. 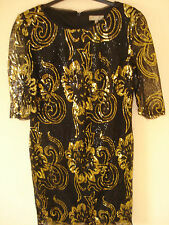 LADIES SILKY TUNIC DRESS. SILKY MATERIAL. WITH BEADED COLLAR. COLOUR - MIDNIGHT BLUE. ARMPIT TO ARMPIT 19". SORRY NO BUY NOW. NEXT Petite. Lovely, clean condition. In black and white with butterfly print. your chance to own this stunning dress. with sheer 3/4 length sleeves. 34" in length from shoulder to hem. 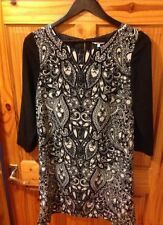 NEXT beautiful tunic, size 12 in new condition.With tag. Beautiful, light tunic. Unwanted gift.Not my style.New. Excellent condition. I will be on holidays from 05/03/19 to 07/05/19. All sold items will be shipped on my return. Any question please e-mail me. Black dress with natural trim piping. The dress is quite a thick fabric. I have other items listed and am always happy to combine postage wherever possible. Please visit my shop Elsie, Mollie & Mae to see my other items. New items are added each week - please do ask if you are looking for something in particular. Please note that any jewellery shown with clothing is for display purposes only and is not for sale. Please also note that all toys and battery operated items will have batteries removed prior to postage, in order to comply with Royal Mail or courier terms and condition. Batteries are not included and will need to be replaced. Payment by PayPal only please, within 3 days of listing ending. Please do not bid if you don't intend to pay. Please do ask if you have any question or require any further information. Thanks for looking - happy bidding!. Lovely black Next dress with geo print. Bell sleeves, tiered hem and back zip. Machine washable. Excellent condition. From smoke free home. Single button to the back of the neck to fasten up, very stretchy material (viscose). length of sleeves 44cm. length of dress 80cm. SIZE UK 14, EUR 42, USA 10. LENGTH 36" (91.5CM). WONDERFUL QUALITY, PHOTOS DO NOT DO THIS DRESS JUSTICE. It’s a fact. My sincere apologies should a problem occur. EASY SHAPE. Ladies DRESS IN SIZE UK14 FROM NEXT. NEXT Floaty Multicoloured Tunic Top in a Size 14T. Length approx 37” / 94cm from shoulder to hem. Lace detail to the neckline, sleeves & above the hem. Fully Lined with Sheer Sleeves. 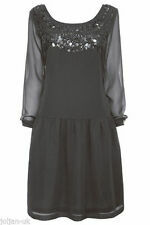 Lovely to wear as a mini dress or with trousers or leggings. In Very Good Condition. From a Smoke and Pet Free Home. Thankyou for Looking. Next Signature dress, immaculate condition, colours turquoise, cream beige, brown. Beautiful embellishment on neck and sleeves, has belt shown in last picture. More than happy to answer any questions. 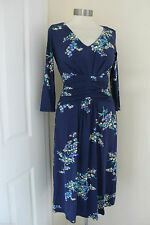 This dress has a black lined skirt to it and the upper half if a lovely floral print. Fastens with a back zip. Fabric: 100% polyester. Ladies Next One Shoulder Purple Pleated Dress Size 12 Scalloped Hem Occasion . Condition is New with tags. Dispatched with Royal Mail 2nd Class. Please ask for any additional photos, information or measurements as I want you to be happy with your purchase. Look carefully at photos as they make up part of the description and items may have slight marks / scuffs consistent with pre-owned goods. Please look at my other items. When possible I will combine postage. If in the unlikely event there is something you are unhappy with please contact me and I will do my best to resolve any issue. Thank you so much for looking at my items.